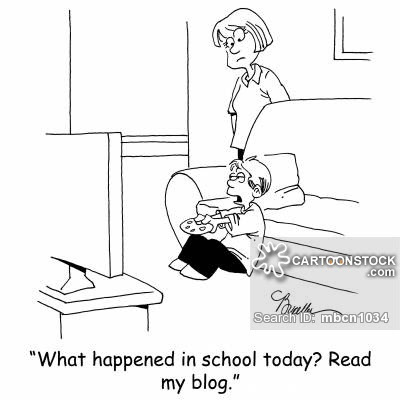 Ages ago, blogging used to be something precisely what the cartoon describes. It was the boom of the internet and IT. People began blogging left and right, sharing things which found audience literally in the opposite part of the world. Orkut was a rage back then, but it didn't have the right means to publicize a person or a webpage as much as Facebook or Twitter does today. I personally loved following many blogs back then, most of which are inactive or simply gone today.It made me realize something - Long gone are days when people blogged purely for passion. With the advent of SEO - Search Engine Optimization and Digital marketing, the true essence of blogging has been diluted. There used to be a time when a simple write up about my day garnered me 3000 hits, now it has come down to a measly 100 hits in spite of writing about far more interesting topics. I had just posted about my experience in Thailand which would possibly have gotten more a 100 views a couple of years ago as it is quite rich in content has a couple of pictures, but today, that article has just gotten over 39 views in a time span of 12 hours. I've shared it on all social media platforms where I have an average of 300 followers. The numbers simply don't add up. Just as I was pondering about all this, Shrinidhi, a fellow blogger, blogged about 9 disturbing trends a blogger needs to be worried about. Do read it here. 1. It's not all about metrics - A community I am a part of on Facebook has all "serious" bloggers. Many members of that community offer guest posts majorly only to people who have a decent DA score. What is DA score? I had no idea until I dug around and did some research. Then there is the Moz Score, the Alexa rank and what not. Google Analytics has a beautiful suite of tools which can help you drill down data right from which browsers your audience is using, to the OS that they are on and of course, the most basic metric of which location they blog to. Does it matter? It ideally should not. However, at the end of the day, it comes back to the big question - Why blog? It is okay to blog for monetary reasons, but that does not give the free rein to mock and create problems for other bloggers who do it purely for passion. Peppering an article with 'top trending' keywords and forcing Google to pick up the article might work, but it doesn't make sense at all. As Shrinidhi mentioned, this eventually leads to poor quality of articles which harms the community of genuine bloggers. The only way to escape from crutches of metrics is to act as a community. Commenting and sharing genuine blog posts, inviting people to guest blog without actually looking at their blog's metrics would certainly help. 2. It's not all about vlogs, pictures, questions and quips - For an average reader, it takes about 7 minutes to read a 1000 word article while it takes around 3 hours to write it. It's the era of Videos and pictures. Then there is this big issue of peppering the article with keywords. The combined effect of these two has literally resulted in lost readership. People don't seem to have the patience to read a 1000 word article. A blog post without a picture is literally of no use today. I agree that videos and picture enrich the experience, but the lack of it should not be the reason for a text blog to be thought of any lesser. Twitter, Facebook and Quora together are the prime reason for people getting accustomed to pictures, videos and short answers. Most answers on Quora are like instant soup. They fill the stomach but aren't nutritious in long run. The real art of research is lost. People look for instant gratification and instant answers. Of course, Quora also has a community of people who work hard to ensure that the answers are sensible, correct and are not just a bunch of links pointing to various websites. Moreover, as Shrinidhi pointed out, Google, the biggest search engine seems to be adapted itself to handle the large inflow of blogs which are stuffed with keywords. It has reduced the importance of text blogs in general to make way to media rich and key word rich blogs. 3. It's not all about positive reviews and marketing always - One piece of advice that I have been given over the years is to find a niche in the blogging-sphere. Why should I? I love to read books, so I write about them. I love to eat, so I write about cooking. Why should I not write about what interests me. Why should I be mocked for doing what I love to do - that is, to write. An excellent book group recently shut it's promotional activities. They were into promoting books by the means of blog hops, book blitzes and reviews. Why have they shut? The person who ran the group reasoned out that the bloggers felt pressurized and were no more ready to review books. There are writers who demand stellar 5 star reviews to drive sales. They insist that the blogger write only good things about their book. Is it a fair expectation? It's not just the book-blogger world which faces this issue, food bloggers and product bloggers have a similar set of problems. It is okay to promote to a brand based on it's merit, but it's not okay to be demanded to be promoted over the sake of it. It is a question of ethics over quick money. I'm going to write my head out - about whatever I like, but as always, I will take care not to hurt the sentiments of other human being. Free speech is over-rated and subjective. I'm going to be as active as possible in commenting and sharing genuine content by passionate bloggers. Somethings are not always about a bunch of metrics and money. For me blogging is one such thing, support if you can, or please show yourself out of my cyber space. Until I joined the Alexa campaign, I had no idea what SEO meant. I am still baffled by all these terms, but I'm trying to find my feet around here. The ironical part is I have been blogging for more than twelve years now. Only to satisfy the pure unadulterated craving to write. As for your end-post plans, I am totally with you on those! Yes, Blogging has evolved over the last decade and half and things have rapidly changed off late. I remember, those days it had it's originality and uniqueness in place. Indeed it has rapidly expanded and gradually diluted with the onslaught of so many other tools and newer platforms. Blogging as a platform it gives the user to express freely and connect widely, and make the best use of it. Initially, there are no rules and there are no boundary but as it evolved the community have created their own set of rules. It limits and it restricts the free flow of thoughts and freedom to express whatever we love to do. Blogging is all about putting our passion and purpose in its proper perspective. Blogging is not merely about the metrics and money, it could well be the by-product but we have been swayed and get wrapped in the logic of increasing our metrics and magic of making money. A deeply thought out post questioning fundamental aspects like the text vs. context and expressing oneself to commercialization of one's expression, where to draw the line or get caught in between. Thank you for stopping by :) I agree with you in all counts. To date, I've not monetized my blog and I don't intend to either. There are somethings money cannot buy - the happiness when a random stranger thinks just like you. I've tasted that happiness time and over to know to value it.